Last year was a huge second year in the life of our small company. I remember meeting my friend Tom for a drink one day, and as I told him about everything, he noted that I’d begun calling us a startup. It’s been a busy, interesting and largely really productive year, and I thought you might like to see all the stuff we’ve done. I’m a big fan of the dictum “aim low, succeed often.” If you’re able to construct goals that you know you can reach, you might just be more satisfied. We set three goals for the year, and we’ve practically reached all of them. Along three themes: user research, sales, and product design. As we’ve talked with more teachers, it’s become much clearer that we need to continue developing and refining our educational strategy. We’re big fans of the idea of 21st Century Skills and Object-Based Learning, and broadly feel like those two themes are a great fit with what we’re hoping to achieve. We’re doing a great pilot deployment with the Education team at Smithsonian Institution Libraries (SIL) in 2018, and that’ll be our first major unattended deployment, in about 10 schools across the USA. We’re looking forward to collaborating with the teachers and students around our general materials, as well as the fabulous SIL content. We also have a list of teachers who’ve expressed interest in joining in the fun. The challenge there is creating enough Brains and Collections to be able to send around! We’re calling 2017 a big success, largely due to the fact that we’ve completed box commissions with lots of great partners. There’s more information below on these, and how they’ve worked out. We hope to grow our commissions program into 2018 and beyond, not only for income for the company, but to build content that consumers might like to make use of down the track. I also feel personally that, as a small startup, having actual customers differentiates us somewhat from the inflated types of tech startups you might find sniffing around for investment. Even though we’re not exactly profitable yet, having customers is a big win! We’re so close to this, largely thanks to Charlie’s superb CAD skills. We call the container box that sits around the Raspberry Pi and other peripherals (NFC reader, speaker etc) the Skull. We’re nearly at V1.0, which is brilliant. Keep your eyes peeled for a blog post about all that soon. We are able to move at light speed compared with the traditional cultural institutions out there. The “sales cycle” )or ability to move quickly on a small purchasing decision) is sometimes months long for museums and libraries, and that’s hurt us a bit, since we’re bootstrapping our operations at this stage. But, we’re no different from most small businesses in that regard, as cash flow is always a challenge. Science Museum tender – how to measure reach? We were thrilled to be asked to submit a tender around building “Science Capital”, but were essentially overlooked because the (current) cost of sending boxes and objects into schools is very small if compared to the potential of “digital reach”. Our contention, though, is that the quality of the interaction generated by tactile, social interaction is really different from a hit on a website. There’s lots to think through about measuring stickiness and success and engagement with Museum in a Box. Innovate UK – We put our hat in the ring for the 3rd Open Round of funding from Innovate UK. It took ages to put the proposal together, and apparently, we scored a “70” (out of 100?). It was a bit disheartening to see the feedback from the assessors, since it was split 50/50 between “this is a brilliant idea, we should fund it” and “I don’t know how this benefits the taxpayer”. But, the silver lining was that the act of creating the proposal helped us refine our thinking around business models, and how we describe ourselves, which has been useful. Fast hardware iteration – it’s hard not having Adrian in the office with us, but in Liverpool (which I’m sure he’ll never leave!). Even though we’ve made some strides in the design and layout of the Brain, each time there’s an update or a treat from Liverpool, it makes me wonder how much further we could have come, and faster, if we could afford to have this work happen much more. It’s all related to general company cash flow and where to place effort, and again, our commissions are what’s helping us drive all sorts of work forward, so we look forward to more of those into 2018! As I mentioned, we have a pretty good strategy around how to build out other products, and the three main products we’re thinking about (or selling now) are: Commissions, Make Your Own, and Direct-to-Consumer collections. As we continue to build our commissions portfolio, we also want to package and sell what you’d need to make your own box (object selection, content research/production, and tech stuff). There’s huge demand for Make Your Own from teachers, and we feel like it might tickle the holy grail of actual cross-curricular learning if we can get it right. Then, we’re hoping to allow anyone to buy a Brain and some Collections, and we’d like to design and develop some of those Collections ourselves, to be best-of-breed examples for everyone, and also a possible container for new collaborations with writers, artists and other “agents” all over the place. There are so many ideas that easily attach themselves to this Museum in a Box idea it can be a challenge to focus on the right next steps! That’s another reason why the commissions are useful to us, because as well as developing the features of the product, we’re also able to do market/user research with our commissioning partners, to learn what they need and want in a partnership like ours. We’d love to do a first release of Make Your Own mid-2018. That’s a goal and a half for this year! We now have a list of 26 boxes in total in our archive. Some are simple prototypes, like our Statues of Women in London, and others are full-blown commissions. This year, we’ve created 10 new box sets. Smithsonian!!!!! – Oh, wow! After nearly 18 months in development, we’re just beginning to start on two separate grants with Smithsonian Institution Libraries in Washington DC. We’ll be making 10 boxes to distribute to 10 schools across the USA, and then delivering two different sets of objects to each class, over the course of 4-6 weeks. We’re so excited to connect with the teachers and students who will be using the box, and also curious about building this first step into a much wider deployment! It’s been really interesting and revealing to see how our commissions (and prototypes) can fit comfortably in the construct that is Museum in a Box. It sounds cheesy to say, but you really can fill this idea with anything that works for you, and we look forward to sealing the deal on our current set of leads for more commissions into 2018, so stay tuned on that! While we’re still working on getting good names for all the bits, we’ve been calling the hardware that you place objects on the Brain. Therefore, we call the casing of the brain the Skull. We had a ton of fun earlier in the year putting together six new brains, with their skulls, to be deployed for our various commissions, and our use for demonstrations and events and such. We’re looking forward to our next Brain-raising session in January 2018, so if you happen to be in London and interested to come and help out for a day, please get in touch. Gill Wildman has been a fantastic supporter and design guide for our work this year. Her incredible experience in listening and questioning and designing for years has been such a useful resource. Thanks Gill. Ben McGuire has helped us with all our legal challenges this year, and co-developed our agreement docs and thinking around resource re-use and potential for royalties and such with our commissioning partners. Thank you, Ben! MOO HQ has been a generous sponsor of our endeavours, helping us with printing resources, and expertise around packaging. Thanks to Chad, Phil T, and Richard for everything. Pango Studios is a company full of talented artists who we’ve sub-contracted to make some of our commissions really sing. Their skills with spray paint and brushes really makes 3D prints look amazing, and we’re looking forward to more! Thanks, Pango! Onwards. We were pretty clear from the start that we didn’t particularly want to get into the 3D printing business, so were really happy to meet Stever from Amfori, who has helped us with printing this year. He’s also up for doing experiments around materiality, which we’re keen to start on soon. We’ve also had a ton of student/post-grad visits: Kate Chan, Michelle Wong, Rosie Parker, Lozana Rossenova, Angeliki Symeonidi, Angela Difede. Thanks especially to Michelle for helping design the first instantiation of a Haunted Objects box! Also thanks to Michelle, for connecting us to Winns Primary in Walthamstow. We really enjoyed our play testing there, and were happy to leave two boxes there for a week to see what the kids did (and what the teachers thought). Thanks too, to Alexandra Deschamps-Sonsino, for her continued support of the company, both with offering us speaking gigs ar the brilliant @IoTLondon meetup, and offering us a table at her Christmas pop-up. People really liked Museum in a Box! If only we could sell them one! 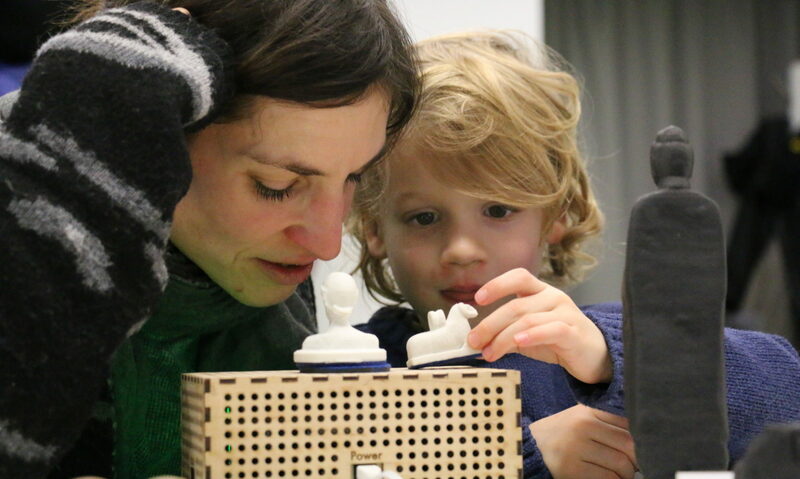 Looking forward to some collaborations around inclusion and accessibility in 2018, particularly with Nicolas Bonne and the Tactile Universe program @ Portsmouth University, and Stacy Rowe, geometry and accessible design @ RNIB. It’s both exciting and a bit nervous-making that we’ve spotted other folk doing similar work in the same space, or nearby. Overall, we think this indicates some trending movement back towards tactility and object-based interactions and learning, and gathering different points of view, all of which are central to what we’re doing. It also feels like the race is on! It was a thrill to be picked up and interviewed by some of our friends in the press this year! Even in print, if you don’t mind! So, to sum up, our 2018 is looking pretty good already. We’re about to move from Bloomsbury to a new (and more cost-effective!) office in Hoxton. We’re looking forward to more lunch options, and seeing if there are simpatico companies nearby who might like to collaborate on some of the hardware stuff, laser cutting, or even software development! We’re watching the Young Foundation Academy program with interest. It’s one of the few “accelerators” that has a focus on social good, and importantly, measuring the effectiveness of companies in that sector. We’re really excited about a possible collaboration with Stacy at the Royal National Institute of Blind People (RNIB). We’re talking about prototyping a box around geometry, and it just so happens while Stacy is the liaison between RNIB and external companies, she’s also a mathematician with mad skills and a ton of personality! If we could do a first release of Make Your Own product sometime in the summer that would be Super Fantastic! And, there are almost too many leads for commissions… this is obviously a good problem to have. We’ve been working on Museum in a Box for just over a year now. We have made lots of prototypes, talked to all sorts of people, and had lots of exciting adventures. This is a little late coming, but Tom and I wanted to consciously reflect on last year’s work as we swing around to planning 2017 (which I’ll write about a bit later). We were also pleased as punch to host Imogen Piper, a design student from Goldsmith’s, and Charlie Cattel-Killick, a sustainable product design graduate from Falmouth University who we ended up bringing into the fold! George: When you’re starting something, it’s so helpful to have simple, unconditional support. Thanks to Russell for thinking of us. Tom: This was great to kick start our production process and get us thinking about collections and the juxtaposition of object and content. Tom: A nice first step working with a biggie. An excercise in designing 3D replicas from scratch and we got to test the box with some real-life museum kids! George: Our first remote deployment. Very exciting to see a photo of the box in Washington DC. Tom: Another stellar commision for us! Extremely grateful to Martin and Sara for believing in our potential. George: It was such a thrill to see Tom make this. A completely new form factor, and public domain content. Tom: Sometimes it’s fun to run with a simple idea and this got a good public reaction. Bonus! George: Dreaming about a large pilot around the Smithsonian Libraries “I See Wonder” program (20 schools across 20 US states, working with kids on design, too) gave us a real taste of how big this thing could get, and stretched us handily considering such a big deployment. Tom: Seeing what happens when we match our design and tech with Sara Cardello’s learning framework was pretty inspirational tbh! George: We always knew we’d need help with distribution of boxes, and MOO’s NFC tech was right up our alley. Thanks to Chad, Phil, and Richard for supporting our crazy schemes! Tom: Another nice (and ongoing) match: MOO make lovely paper products with embedded NFC that plays nice with our Brains. Plus we get to hang out with packaging expert Phil Thomas. George: One of our first pieces of work that went from original objects to prints, thanks to Tom’s amazing 3D chops. Tom: A nice validation of how 3D scanning can create access to the inaccessible and an amazing glimpse into how hard small museum staff work to connect people to heritage. George: All sorts of opportunities here, from in-gallery display to outreach. Plus, they have an enigma machine. Tom: Feels good that museum education staff here are exploring how 3D & interactive can be used in their work. George: Part of our 2016 strategy was to try to work directly with big museums. Proud to say our “Frogs in a Box” box achieved this goal. Tom: Wuuuut?! Yes this is true and makes me very happy. George: Even though the PCB is quite small, this was an exciting step for me. I absolutely love our physical progress bar feature, and was equally thrilled when Adrian suggested a custom board to support it! I should probably make some jewellry. George: We had been thinking integration with micro:bit would be good for us — probably like lots of other people! — because it has been so well distributed across the country. Still thinking that. Tom: It was amazing to have Tom and Michal from Microsoft Research (!) in our studio, taking us through the possibilities of connecting our Brains to the micro:bit – and then making it happen! Tom: We were invited, we prepared, we missed the plane, we made a video, we were there in spirit. VHN are lovely people! George: I really enjoyed meeting the folks around this workshop, particularly the amazing 3D printing engineers at Lancaster. Thanks to Richard and Caroline for inviting me! Tom: An exercise in capturing an event and working with (very clever) young people at the event in Berlin. George: Great to visit Brussels to talk about our work and “virtual heritage”. Nice to have Lizzie Edwards as my travel companion, too. All in all, a pretty good year! Can’t wait to build on what we consider to be a great success. It’s also important to recognise and celebrate the efforts of Adrian McEwen, our brilliant technical partner from The North, who is responsible for much of the hardware-related development we’ve done this year (and some software too). Thanks, Adrian!